If you think this is worth it, let me know. I'll put the materials in here, and based on your feedback, I may need to tweak the info a bit by using subsequent posts. DISCLAIMER: This article deals with modifying a propane-powered heating device. If you are uncomfortable in doing this, consult your local hearth store or a professional. This firepit's been mostly OK, but my nephew the glazier said, "Ya know, that lava rock stuff in there doesn't look very cool... The current trend is to have crushed glass, for a Fire from Ice kind of look. I'll get you a sample from our stock." I must comment here that for this project, you cannot use plain glass, like bottle glass, or anything else EXCEPT tempered glass. ONLY tempered glass can stand the heating/cooling cycles safely. And on his next visit, he brought me a sheet of Azure Blue glass in a packing box. The first thing to do was to get the glass to break. I tried a screwdriver and a hammer in the middle of the plate, but no luck. So I asked him what to do. "Tempered glass is really strong across its surface, but weak on the edge. Hit it there." So I put the sheet of glass inside a big tub, stood it on edge, and covered it with a dropcloth. It only took a single blow, and POP, it crumbled into nice cubes. If you don't have access to this kind of glass, you can buy 'Fireglass' online, for about $30-$40 for ten pounds. So with the glass ready to go, the next thing is to modify the firepit. Remove all the lava rock from the firepit and sort it for size. Set aside any pieces that are taller than the burner top. Using the remaining pieces, take the largest that will fit under the burner top, and slide them inside the crown of the burner top, so that you create spaces and voids that the burner can work through Set them tightly together so that they lock together, giving a craggy space underneath the burner top. Fill the bottom of the burner area to below the level of the burner top with the remaining pieces of lava rock. If you don't do this step, when you pour in the glass, there won't be enough to fill the top of the firepit, and the glass will lock tightly together, making it impossible for the firepit burner to work right. Put on gloves and pour the glass slowly into the firepit. Pick up any wayward chunks with the gloves. Look for small shards (I found a few in mine) and discard them carefully. Once the glass is poured into the top of the firepit, (I didn't level mine - it looks better to me this way), open the door where the propane bottle is stored, disconnect and remove the propane bottle temporarily. Now get some metallic tape - the kind used for sealing chimney ducts - and wrap it around the air intake on the bottom of the burner. Don't stick the two edges together to make a tight seal, but instead leave them apart by an inch or so. This is the starting position. Re-install the propane bottle and hook it up. Get a blowtorch so that you can start the firepit reliably. Start it in the usual manner, by pushing the valve in. You should have a pretty good fire in the firepit. Allow the glass to warm up for a few minutes on high, then turn it down most of the way. If the firepit doesn't blow out, then turn it down all the way and watch it. If the firepit blows out, turn off the gas, allow the fumes to clear for a few minutes, and close off a little more of the air supply to the burner. The trick is to have a little bit of air supply but not too much, because your flame front is now in the glass and not in the burner area itself. This modification is unsafe. Period. Do not attempt to modify this type of firepit. I have been working on the firepit every evening to assure it can be made perfectly reliable, and there is no safe way this can be done with this type of firepit. I'm a lamp guy, and more than used to working with fire, and keeping it safe. 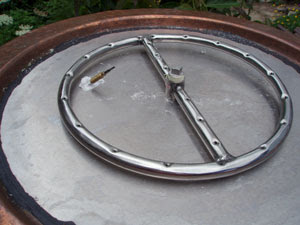 In this type of firepit, with the large round burner, the glass restricts the burner operation in this particular type of firepit, and cannot be made safe. I cannot speak to other types. Over the last couple nights, I've been fiddling with it to try to get it to be reliable. It would suddenly snuff and then would be dumping raw gas. Or it would snuff because the burner wouldn't be working right and the mechanical 'proof-of-fire' mechanism would think there wasn't a fire, and shut off the flow of gas. I had it working perfectly, reliably, last night. It was putting out GREAT heat. I was ecstatic. I had it working so well it was to the point I could leave it going and walk away for a few minutes. About ten minutes before I was to go in, I started smelling "HOT" smell. I put my hand on the granite surround, which is normally dead cold, (in the pix, you can see how cold it normally is) and the granite surround was almost hot enough to burn you. And it was that hot all around the top of the firepit, down about six inches from the top. I've been running it with the side open so I could reach in real quick and turn off the gas when it snuffed, last night was no exception, which was fortunate. I jumped up real quick and looked in, and there was fire, right on top of the heat shield. Where fire isn't supposed to be. And everything was starting to stink real bad from the heat. Of course I shut it down right away, and I left the drawer open so it would cool off and get safe, faster. I've blown my nose so many times trying to get that stink out of my nostrils, and I can still smell it at times today. Tonight I'm going to open it all up, take out the glass, and thoroughly inspect it to make sure it's still safe to use. Once I have given it a good going-over, I'll have to put it back the way it was, so back goes the lava rock, and nothing else. Mods, I will leave it up to you to decide whether to delete this thread in its entirety, or leave this note as a caution that this modification cannot be done safely, in case others might attempt it. I'll say it again. Learn from my mistake! I got fortunate, because I don't trust fire! Thanks for the update. We'll leave it here for a day or so until you determine the possible causes and then probably move it off site. It was a great looking project! What about lining the bottom and sides with fire brick ??? The firepit's problems all stem from the burner design. The burner design I have is made for heat production, not pretty flames. The root of the problem is the glass packs tight around the burner and won't allow a proper chimney effect. And the burner in mine has to have that chimney, otherwise the fire finds another way out. Before I tried this (when I had the lava rock in it), I was able to easily tweak the air/fuel mix so that the firepit produces a fair amount of 'pretty flames' and yet not be shut down by the proof-of-fire safety device from low heat production. With this modification, I'd thought I'd figured out how to manage everything just so, but I was wrong, almost catastrophically so. I had a VERY close call. What happened the other night is that the flame front had quietly migrated back toward the bottom of the burner (backdrafted) where the air shutter is, and it was getting just enough air to stay lit. Fire was going everywhere underneath the burner area. And it didn't self-extinguish, so stuff just quietly kept getting hotter and hotter. Multiple holes (note the huge jet size, not like a barbecue burner), wide area spread, so it stays lit in a wind. That's probably a range-type automatic self-igniter in the photo. Handy to have in windy areas. My firepit has what looks like a conventional gas stove burner, only about 3 times bigger. My flame cap (top piece) is wider, roughly the size of the base. So you can see that when I covered the burner with glass, there wasn't enough 'chimney' for the flame to escape - and it found other ways. I'll go back to the lava rock, and look for a used burner somewhere. Moral of the story: unless you have a burner like the ring burner shown above (they also come in rectangles and stars), do NOT put glass over the firepit burner. Back to Square One... Maybe not! So, I thought I was back to Square One with the stupid lava rock. Or... maybe not... I had a brilliant flash of an idea about Char-Broil's ceramic briquettes, they're not expensive at all, and they don't look bad in this application. Here's a shot of the halfway point of filling the firepit with the ceramic briquettes. You can see the burner type that I talked about, and how it's not compatible with fireglass. So now we have a successful upgrade, and the firepit has more/better heat output because of the radiant energy of the ceramic briquettes. All the heat energy is on the top now, where it should be, not underneath - and it's working the way it was designed to do. Bonus: the ceramic briquettes put out a lot of heat, so I don't have to run the gas as high as I used to. But the firepit and its surround stays cool. And safe. And finally I can trust it again. So now we have a good end to this story. Thanks for the advise. I am considering a fire pit on the patio, and yes glass is being considered. I will be a lot more careful now.